When you’re in the market for a used car in the Chicago, Skokie, and Park Ridge areas, you might hear the term certified pre-owned every once in a while. Certified pre-owned vehicles have to pass a higher level of scrutiny to be classified as such, and they also come with additional benefits you won’t find with a used vehicle. If you find yourself wondering, “What is certified pre-owned?” this handy guide will help. Learn more about certified pre-owned vehicles and discover how they can benefit you. Not all used cars are qualified to be classified as certified pre-owned. A used car can have any number of miles on it and can be any number of years old. However, a certified pre-owned car will have a low number on the odometer and won’t be older than a couple of years. No matter how well a car is taken care of, time and miles are the key factors in determining value. These cars must also go through a multi-point inspection and pass with flying colors. At our service center, we submit these cars to a 125-point inspection to determine its exact status in a variety of areas. All certified pre-owned vehicles must meet qualification standards, mechanical standards, maintenance standards, appearance standards, detail standards, and they must have all ownership materials and records complete. After a vehicle passes its inspection, you’ll find some innate advantages from the get-go such as reliable performance and satisfactory appearance. One of the most useful advantages, however, is the CARFAX Vehicle History Report™. Complete with every certified pre-owned vehicle, you’ll have a complete report that not only assures that the vehicle is free of title obligations, but it also contains the most detailed kind of history report you can get. Certified pre-owned vehicles also tend to have greater warranties like our 7-year/100,000-mile powertrain limited warranty. In addition, you’ll have access to roadside coverage including towing/roadside assistance services. These include lockout services, towing services, battery-jump assistance, gas delivery, and more. The difference between certified pre-owned vehicles vs. used vehicles comes down to quality. With the rigorous standards certified pre-owned vehicles have to meet, that much is clear, but you might be considering buying a used car with an extended warranty instead. While that may seem like a good idea, you may sacrifice on quality, and the parts may not be up to the highest standards, as they would be in a certified pre-owned vehicle. To truly understand the difference a certified pre-owned vehicle can make, you need to experience it for yourself. 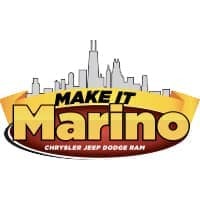 At Marino Chrysler Jeep Dodge Ram, we have an expansive inventory of certified pre-owned vehicles of various makes and models that you can try. The best way to answer, “What is certified pre-owned?” is to show you, and that’s exactly what our friendly staff is ready to do. Visit us or call (844) 827-4514 to schedule your test drive today!